Objective: Your job is to eliminate criminals around the world as a sniper and complete risky missions. Shoot the henchmen and make sure they don`t alert the others or the whole operation will be ruined. Once you go through all the guards, their leader will try to escape so try to shoot him before he gets away. Use the focus mode to slow down time and get a perfect aim at your target. Remember to reload and destroy all the bad guys quickly! 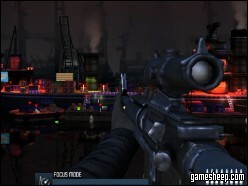 We are glad that you have chosen to play Stealth Sniper on GameSheep.com, the most dynamic website available. If you like this game Stealth Sniper don't forget to rate it and this way you will help with selecting only the best games for the home page.